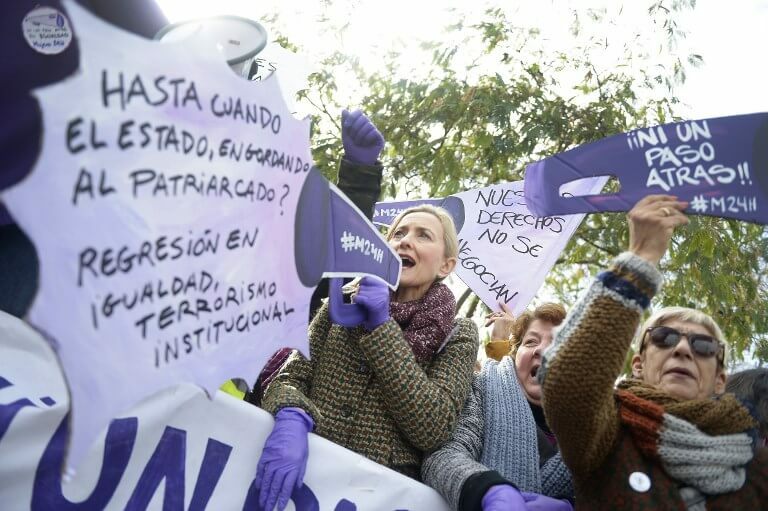 Spain’s powerful feminist movement rallied across the country on Tuesday against far-right party Vox for seeking to scrap tough laws against gender violence which it argues ‘criminalises’ men. Thousands of people, mainly women, gathered at noon outside Andalusia’s regional parliament in Seville, where Vox will on Wednesday endorse a conservative coalition government made up the People’s Party (PP) and Ciudadanos (Cs), putting an end to 36 years of Socialist (PSOE) rule in Spain’s most populous region. The demonstrators chanted ‘Our rights are not negotiable’. Many wore purple or waved purple – a colour long associated with gender equality. Further protests against Vox are scheduled to take place at 7:00 pm across Spain, including in Madrid and Barcelona. The slogan for the protests called by feminist groups is: ‘No step backwards in terms of equality’. The party says these laws encourage unfounded complaints against men by women ‘without scruples’. Vox, which also campaigns against illegal immigration, has also called for an end to ‘subsidised radical feminist associations’. The party won a surprise 12 seats in Andalusia’s parliament in a regional election last month. It initially made scrapping Spain’s gender violence laws a condition for its support for a People’s Party-Ciudadanos coalition government in the region, prompting an outcry. It eventually dropped the demand. ‘Denying gender violence and the need for policies of equality is a radical position which is outside of democratic norms,’ Deputy Prime Minister Carmen Calvo said Tuesday. Vox’s leader in Andalusia, Francisco Serrano, sparked new controversy on Tuesday by calling the feminist mobilisation ‘kale borroka‘ – a reference to street violence by youths who supported the armed Basque separatist group ETA in Spain’s northern Basque Country. Vox’s performance last month in Andalusia was the first time a far-right party has won representation in a Spanish regional parliament since the country returned to democracy following the death of longtime dictator Francisco Franco in 1975. The protests against Vox come less than two months before feminist groups in Spain mark International Women’s Day on 8 March with another strike. Last year over five million men and women took part in an unprecedented two-hour strike held on International Women’s Day. Before Vox’s rise, the fight against gender violence enjoyed wide cross-party support in Spain. The Spanish parliament in 2004 unanimously passed Europe’s first law specifically cracking down on gender-based violence that offered free legal aid and established special courts for victims.